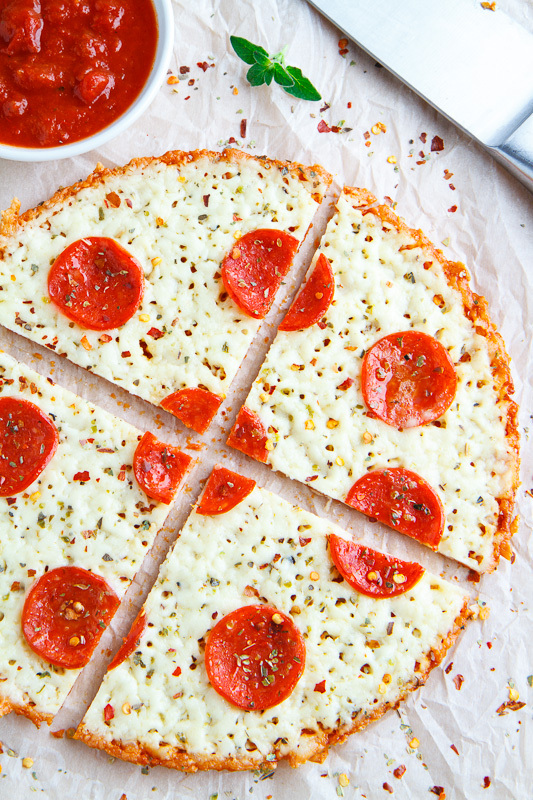 The ultimate low-carb pizza, the no crust pizza! The cheese itself is the crust and it’s topped with pepperoni and dipped in the pizza sauce! 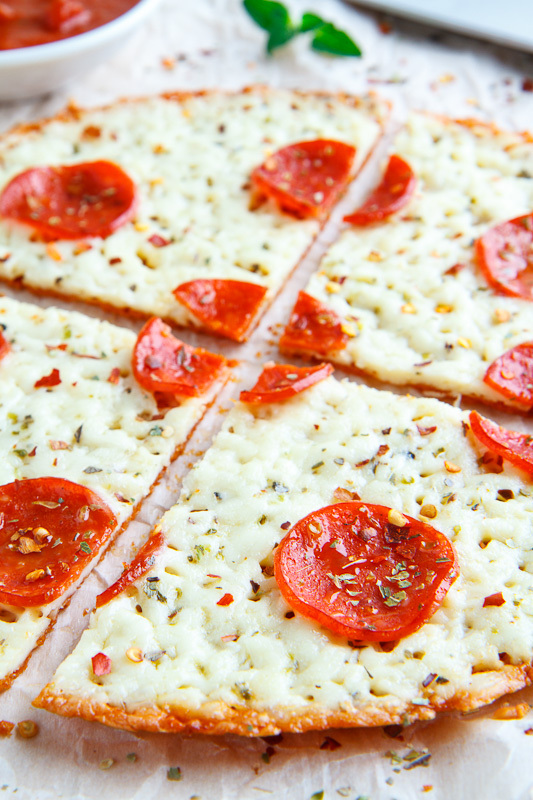 All of the great flavours of a pepperoni pizza without the crust! First I brought you the cauliflower pizza crust and then I brought you the zucchini pizza crust and now I bring you the ultimate low-carb pizza crust, the no crust pizza crust! Yes, that’s right a no crust pizza crust! You know how the melting cheese sometime ooezs out of a grilled cheese sandwich, sticks to the pan and hardens on the bottom? That’s the idea behind the no crust pizza crust, you simply sprinkle the cheese onto the pan, let it melt and cook until bubbling and nice and golden brown on the bottom before letting it cool a bit so that the bottom gets solid enough that you can slice it and pick it up just like a regular slice of pizza. Hold on, I know what you are going to say! What about the toppings and the sauce? 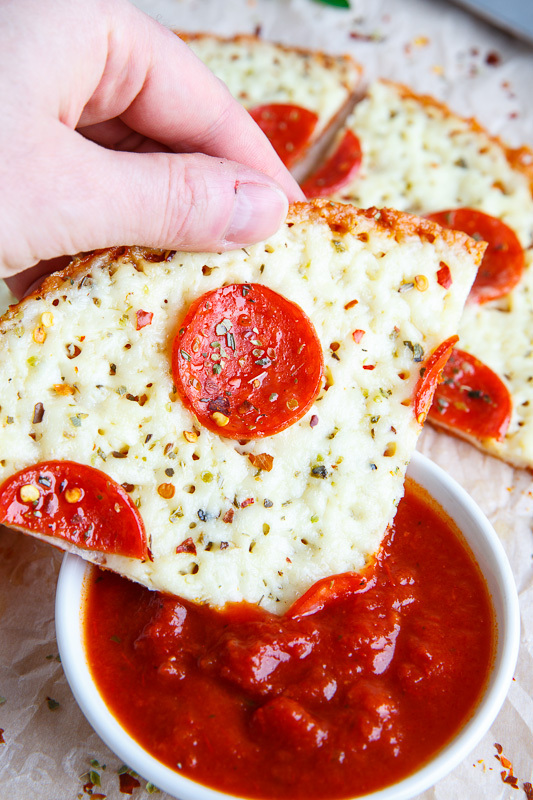 While the cheese is cooking you can sprinkle on your favourite pizza toppings and then you can dip the pizza into some pizza sauce as you eat it! And there you have it a no crust pizza crust with all of the flavours of pizza and none of the carbs or the leftover crust ends that nobody wants to eat! 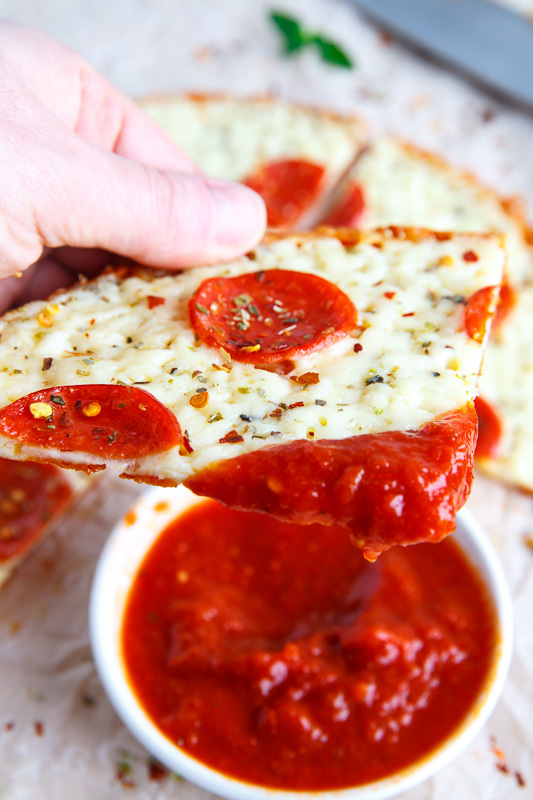 The all cheese crust holds up perfectly for dipping! Who need a bread crust? The cheese works all by itself! Sprinkle the cheese into a small pan, top with the pepperoni and cook over medium heat until the cheese is bubbling and the edges are golden brown before letting it cool a bit to allow the cheese to set. I LOVE this idea so much!! Seriously genius. 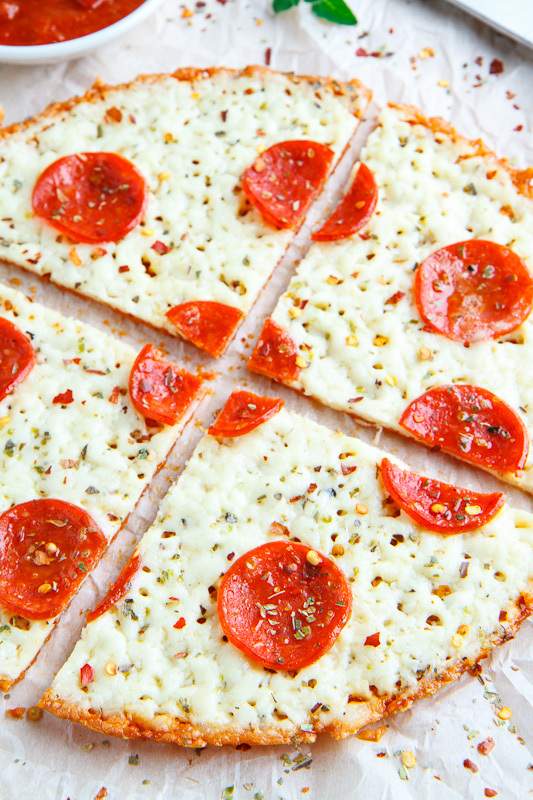 I love the cauliflower crust…how does this compare in your opinion? Kevin, your instructions say to "cook over medium heat". Does this mean you cook it on the stove top, or can it be done in the oven? Great idea for those on a low-carb diet (Atkins etc) but not so sure about everyone else. The sat fats (per slice?) are very high! When you're eating pieces of cheese dipped in tomato for dinner, you NEED to STOP. So happy to start eating clean again with this recipe!! Hope I can keep this momentum going! Since, the directions weren't clear I assumed this was supposed to be cooked over the stove top. Against my better judgment, I pre-sprayed with Pam and watched it closely. It burned right onto the pan. Total disaster. Wasted cheese and pan I'll spend hours attempting to clean. Ah! Miss Violet Love: Yes, you are supposed to sprinkle the cheese into a pan and cook it on the stove top. Cheese has enough fat in it that you should not need Pam spray to prevent sticking. If it burnt onto the pan then you cooked it too long, you need to take it off the heat when the edges turn a light golden brown. I would think you could throw some other pizza toppings on the cheese as it cooks, then roll it up and dip it. Yum! The possibilities are endless: buffalo chicken pizza, chicken, onion, and bacon dipped in a lo carb BBQ, etc. Sorry, I may have just drooled on myself. Sans the pepperoni I think this will suit my diabetic diet. Looking forward to trying it. I should think you can cut fats and salt by using low fat mozzarella, veggies instead of pepperoni, or lean ham instead. I like olives, anchovies, tomatoes and artichoke hearts on mine. Those pictures look too perfect…I can see me burning the cheese, setting my kitchen on fire, then snapping a picture to put up next to it on Pinterest with the caption "nailed it". Christine de Klerk : LOL!! It's actually pretty easy to make! I hope you get to try it! Now when you say small pan, just exactly what size is small? 8" 10"? I dont want to use to small and have to much cheese, or just the opposite, to large a pan and not enough cheese…Cant wait for a reply so I can give this a go! Kathy: I use an 8 inch (bottom) pan. Enjoy! love this, first time was too soft 2nd time just right. Nice going! Tried it tonight with a ceramic pan. My stovetop doesn't heat evenly so I had to keep and eye on it and turn it every ice in awhile. Came out perfect! Next time I'll let it cool a bit longer. I was so hungry I ended up using a knife and fork to eat it but it was delicious and certainly tamed my pizza craving. Kevin you might want to adjust your recipe to add… in an 8 inch frying pan on the stove top….since everyone is so used to putting pizza in the oven. And you might want to add the "take it off when the edges start to turn brown". Lots of non cooks have to follow recipes. Me, I make them up as I go! LOL!!! This is awesome, and as a variation you can do mozz, any BBQ sauce or mustard style of choice and then place several slices of hard salami and when cheese starts to bubble, remove from heat flip over in half, slice and enjoy a great Low carb snack or meal. I've use shreaded BBQ Beef and pork as well and is yummy! What a disaster!! It would help if you showed the 'pan' you use and how you get it out of the pan. Plus exactly how long to cool – how long is 'a bit'. I did scrap enough cheese and pepperoni to have a snack. Only good thing about this experience…I got good arm exercise by scraping pan. Are the nutrition facts listed here for half of the pizza or for the whole thing? I just made this for dinner tonight and I am in heaven. Missed my pizza with having to be on a low carb diet now. I would make this as an appetizer for any of my friends. Delicious. Regarding "sticking to the pan pizza"….could there be a difference between REAL Moz. being shredded and packaged Moz. (which we all know is mixed with flour)? Anyone can add their thoughts on this. Thanks. Micki Cesario: I normally grate/shred my own mozzarella from a block or fresh so I have not tried the pre-shredded. I will have to get some pre-shredded packages to try! This is brilliant, I’m so doing this! Thank you for this great idea!!! Just made it, and it turned out perfect. I'm going to try this right now. I have a LOT of leftover pepperoni I need to get rid of. Question, though, does it HAVE to be mozzarella? I have a "mexican blend" bag of cheese. I just made this and it was so delicious! What a great and easy idea. I paired it with Rao’s Pasta Sauce which is sugar free and only 90 calories per 1/2 cup. I only used a few Tablespoons worth. This is definitely worth making again! This was so easy, and delicious!